Welcome to the newsletter of the Sherman Democratic Town Committee, particularly to our new subscribers. Our goal is to share with local Democrats news and resources to help us stay involved for positive change on a state and local level. We are committed to working for and with the citizens of Sherman to promote issues, initiatives, and candidates that will make Sherman a better place to live and work. Meet with our newly elected State Senator Julie Kushner to learn about pending State Senate action on paid family leave, raising the minimum wage, tax reform, supporting quality schools, protecting the lake and Sherman’s air quality, and other issues. Continue the discussion began in January at the Senator’s First Sherman Conversation..
Shermanites with all political viewpoints are welcome. 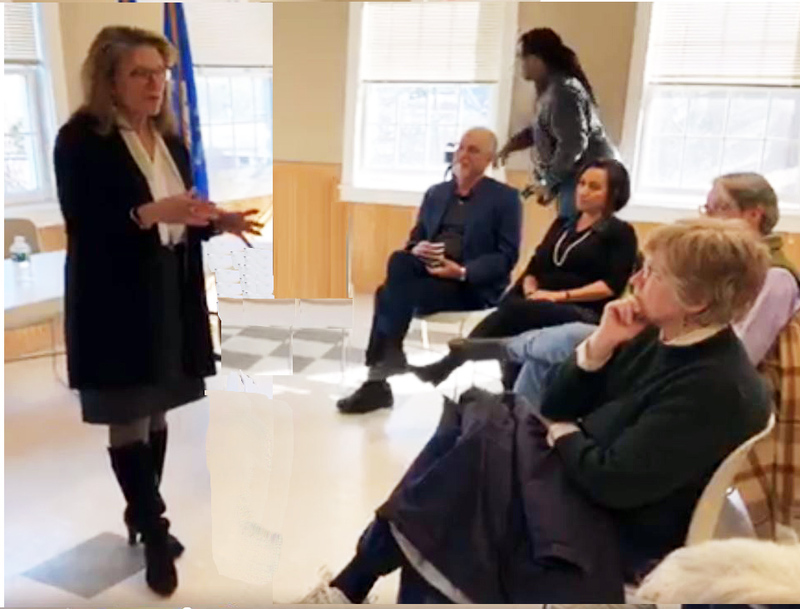 On Jan 26th, our new State Senator Julie Kushner held her first “Community Conversation” with Sherman area residents at Charter Hall. Chaired by long-time SDTC member Barbara Ireland, all Shermanites, regardless of their politics, were invited to dialog with Julie. If you missed the conversation or just want to experience it again, then click here to see the video. Senator Kushner began by describing her first days in the State Senate. She will Co-Chair the Labor Committee, serve as Vice-Chair of the Committee on the Environment, and will be a member of the Housing, Transportation,Education, Appropriations, and Executive and Legislative NominationsCommittees. . .
Julie described how bills are introduced, discussed, and acted upon. After a bill is introduced, committees may hold public hearings during which residents may appear or send in written comments. For more information, click here to find a bill of interest and whom to contact. Or ask Julie..Julie has already co-sponsored about 50 bills! Senator Julie talked about bills of special concern to her. First and foremost is her signature issue which she introduced,.the paid family leave bill (SB1), To read the bill, click here. It allocates 12 weeks leave at full pay for a new child and for illness in family members. Funded through a payroll tax, most Connecticut workers (also potentially self-employed workers) are covered. Elections matter! Our Republican State Representative, Richard Smith, voted against the bill. She also co-sponsored the Minimum Wage Bill (SB2) which would raise the minimum from $10.10/hour to $15 over the next few years. To read the bill, click here. Our neighboring states, New York and Massachusetts, have minimum wages much higher than Connecticut’s. Again, Representative Smith voted against the increase.. An audience member then expressed concern about this legislation on small businesses and, went on to describe other needs of small businesses. 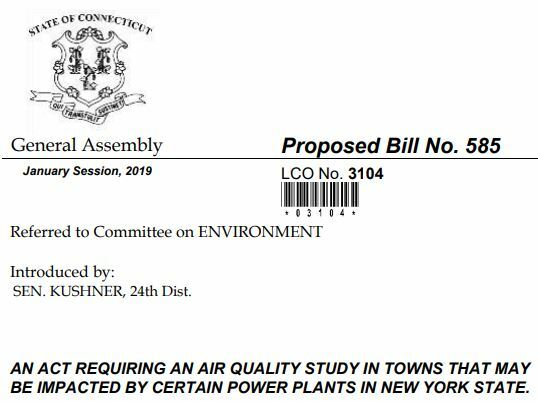 Of special interest to Sherman, Senator Kushner introduced SB585, which requires an air quality study in towns that may be impacted by the nearby, soon-to-open, Cricket Valley gas burning power plant.. To read the bill, click here. An air quality monitoring station is now operating at Kent School,The bill adds state support for using the data for longitudinal studies. 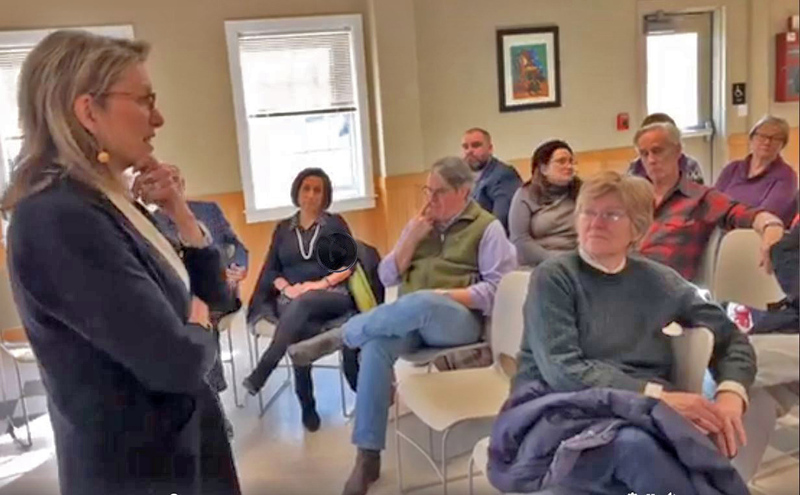 An audience member wanted the Connecticut Attorney General, Department of Energy and Environmental Protection, and the Department of Health to also address this issue. Sherman First Selectman Don Lowe raised concerns about proposals to consolidate auto and property tax collections by the state. To read the bill, click here. He felt they would negatively impact small towns such as Sherman. Julie commented, “We don’t have a spending problem in CT, we have a revenue problem. We have to ask our super-wealthy people to put more in.” We need an equitable way to bring in revenue, she elaborated, balancing the resources and needs of small and big towns, of richer and poorer people. One source of potential revenue is from currently un-taxed property owned by not-for-profit organizations such as hospitals. Reform of tax laws, she added, must be addressed in a holistic way, not piecemeal..
Supplementing the above, a fresh approach is being undertaken that has other states interested. In lieu of cash, the state may donate some of its real assets as an in-kind contribution to its pension funds. The “conversation” with the audience continued. While many attendees asked questions or raised concerns to Julie, more often the questions served as a springboard for discussions within the audience. In several instances, audience members made plans for longer term interactions and joint projects among themselves. • Addressing the impact of the then-ongoing shutdown of the federal government in Connecticut. To contact Julie,visit her site by clicking here. Or call her legislative assistant, Javier Smith, at 860-240-0509, or 1-800-842-1420. To sign up for Julie’s e-newsletter, click here. With these issues warmed-up, the next conversation with Julie, this Saturday, March 16th at 1 pm, should be a lively one! Time to Make the Sausage & Lots of It! Since the Connecticut General Assembly convened for its 2019 session on January 9th, 3,629 bills have been introduced!.It’s the same number as in 2017 of which 265 became law. Brought on by the nation’s “Blue Wave” 2018 election, the new Democrat trifecta—Governor, House and Senate: all Democrat-controlled—has issued a crop of bills that reflect their mandate in content and perhaps will have their likelihood of success. With the Governor’s budget just released in February, fiscal realities are soon to meet up with social ideals in the ugly grind of lawmaking that is traditionally likened to watching sausage being made. Yet, we can already report real legislative progress. .
Five new Democratic Senators, creating a majority of 23-13 in the Senate, and 12 new Democrat State Representatives, creating a majority of 92-59 in the House,.have brought new enthusiasm and commitment to creating laws favoring social and economic equality and opportunity, For example, Senate Bill 2 would raise the minimum wage to $15. Senate Bill 1 would allow people paid time off and job security in the event of a new child or family illness. Co-sponsored by our Senator Kushner, it is already on the calendar for a vote by the entire Senate. Stymied for years in a Republican-controlled General Assembly, this bill is expected to become law providing a compassionate, practical means towards saving families from spiraling into homelessness and poverty from job loss caused by illness. Julie Kushner has wasted no time in learning about local issues that affect her constituents and responding to them with proposed bills, all while signing on to dozens of bills that affect the state’s government and it’s citizens. As noted in the previous article, Julie Kushner has sponsored two bills that are very important to Sherman: one addressing Candlewood Lake’s potential infestation of mussels, and another establishing an air quality study in CT towns that may be affected by the Cricket Valley Power Plant. To follow Julie’s actions as State Senator or to contact her, click here. Most of the bills facing the General Assembly address the overarching issue of CT’s fiscal deficit. Governor Lamont campaigned on fixing it and his newly released budget addresses it. Highway tolls (see the article below), legalizing marijuana, school regionalization, and expanding gambling are proposals, among others, aiming to save or earn money for the state. Their fates are less certain because some measures are controversial (marijuana and gambling) and others challenge Connecticut residents to weigh the benefit of the whole population against individual disadvantage (school regionalization, tolls, and certain taxation proposals). However, with a newly enlarged and emboldened Democrat majority in power, these bills may succeed, albeit with much grumbling. These are only a few of the major issues you are likely to hear about over the next year. On just about any subject, “there’s a bill for that”—and often more than one. Bears in your backyard? You can support a bill for hunting them or a bill for researching nonlethal methods of bear control. To learn more about whatever issues you are passionate about, or maybe if you are just in the mood to see if anything is being done about your pet peeves, check out legiscan.com. It’s a robust resource, easy to navigate, and even kind of funny. The “Legislation 101” piece describes how a bill makes it through the legislature in Connecticut, and to realize that as ugly as it gets here, it’s worse in Tennessee and Nebraska (according to the author). By the way, as measured by public interest and activity over the last 72 hours until now, March 10, the number one trending CT bill requires immunizations against the meningococcal virus and human papillomavirus.(HB07199). To (1) require the Commissioner of Transportation to submit a tolling proposal to the General Assembly; and (2) create the Connecticut Transportation Finance Authority (HB07280). This bill requires a vote in both houses within 15-days of the Committee hearing, if not, the bill is automatically approved by the General Assembly. Also click here to read the 500-page report submitted to the then Governor-Elect Lamont by his transportation advisory panel. 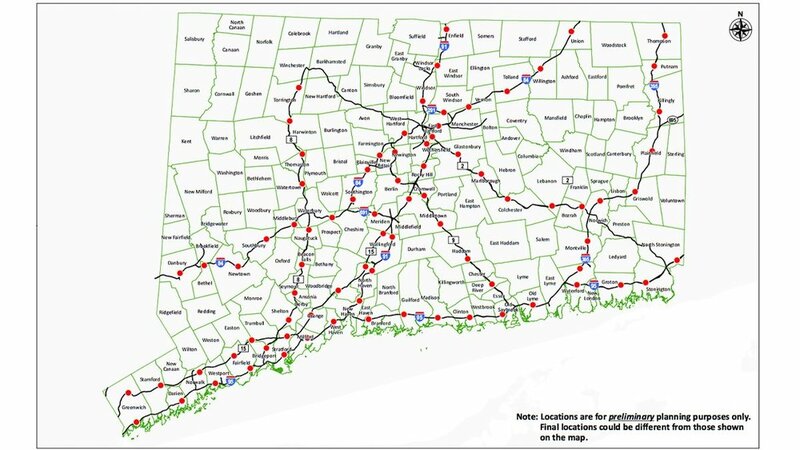 The map below is from that report according to www.notollsct.org which shows 83 possible toll locations in red dots.The report itself does not recommend implementing that many. Last Wednesday, March 6th, hundreds of proponents and opponents descended on the state Capitol for the hearing on electronic highway tolls. “We’ve got to bring our infrastructure into the 21st century, and we’ve got to do it now,” said Governor Lamont, who was joined by scores of toll supporters at the Legislative Office Building. “This is about jobs…This is so key to economic growth and opportunity in this state.. ”, as reported in the Hartford Courant. It also said “Lamont’s budget calls for tolling all vehicles on I-95, I-91, I-84 and Route 15….The precise locations of the gantries and the tolling rates have not been determined. State residents with an E-ZPass would receive a discount of at least 30 percent, according to Lamont’s budget.” Lamont ran on a plan for tolls only on tractor-trailer trucks but now says that would not raise enough to fix Connecticut’s roads and bridges. Almost all Republican legislators are against it and propose an alternative, a 30-year, $65 billion plan that would rely on state bonding to fix CT infrastructure. In his budget proposal, Some legislators want to wait to see how much funding Connecticut receives from the federal government for infrastructure improvements before making any moves on tolls. The Federal Highway Administration has already said Connecticut is in “new territory,” because no other state has undertaken tolling existing highways – and certainly not all the existing highways. Clearly, this issue challenges Connecticut residents to weigh the benefit of the whole population against individual disadvantage. We are an organization of inclusion, not exclusion. We have a longstanding history of attracting both Democratic and unaffiliated voters and endorsing both Democratic and unaffiliated candidates. We work to represent the wide variety of Sherman citizens who hold many different viewpoints and opinions.